Before starting the topic let us know about some terms which will be used in the article so that a thorough grasp of the subject be achieved and it will also help you in prelims or other objective exams. Bustard: They are large, terrestrial birds living mainly in dry grassland areas and on the steppes of the Old World which includes floricans and korhaans (both belongs to bustard family). Steppes: These are large area of unforested i.e., without trees flat grassland mainly found in South East Europe. 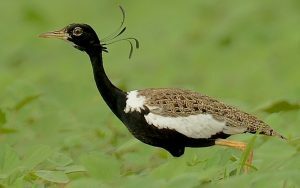 Now let’s start the main topic about Lesser Florican bird. 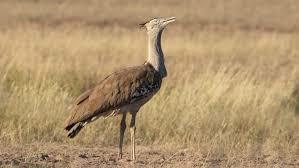 These are smallest bird in the bustard category, eye catching in both appearance and behavior. Typically small and slender, with a long, curved neck and thin, gangly legs. Female bustard is larger than the male. With just 264 remaining in the four states in India, there is greater danger of them becoming extinct from the India. It is threatened under the International Union for the Conservation of Nature (IUCN) Red List of threatened species. The bird is endemic to India where it was found in abundance in the past in the areas of Bengal to Gujarat, Saharanpur, Uttar Pradesh to Thiruvananthapuram. Alongside India it was also found in Pakistan, Myanmar, Bangladesh & terai region Nepal. But our bad practices led its region be confined to only four states of Madhya Pradesh, Maharashtra, Western Rajasthan & Gujarat. This shows the criticality of the situation, that they are being limited to the few districts of four Indian states. 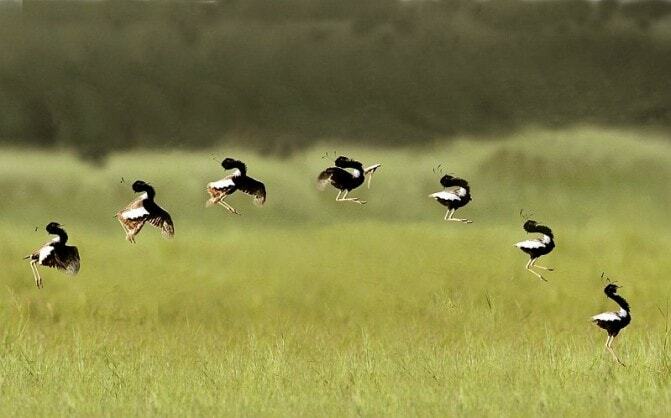 Lesser Floricans are birds of grasslands. They eat and live here only as they find insects and seeds here but due to bad practices their grassland have been used for agriculture practices & use of chemical fertilizers which killed the insects on which they feed has further added to the misery. Windmills, Poaching , excess livestock grazing & Stray dogs are other important factors for their reduction in numbers. A good management of above can be found useful to protect the remaining birds and increase in their number with monitoring, captive breeding and scientific management of grassland among others good measures. In Madhya Pradesh, Ratlam district we already has a specially created Bird sanctuary named as Sailana bird sanctuary which falls in Ujjain forest division for the Lesser Florican Bird. Immediate & some Quick action methods for their conservation is necessary to save the bird because when a species declines by 75% in population within three generations then they come into critically endangered threshold and this has happened with Lesser Florican. In our country at policy level the lack of protection of these species has remained a big concern which further pushed these endangered and critically endangered species into a corner. 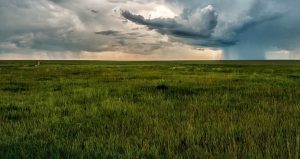 Like in March 2018 when Environment Ministry published a draft of New National Forest Policy 2018 it again failed to acknowledge the importance of grassland as habitat. It’s necessary to protect their habitats else their vulnerability to extinction will always loom large.